Safari King slot takes us to the vast savannas of Africa. As you explore the grasslands, you will find many animals native to the continent. But you will also find vile, colourful invaders – playing card icons the sizes of elephants and lions! Silliness aside, the symbol quality on the playing field is great – at least, for the unique animal icons. The reels look like they are made out of wood and decorated cloth, surrounded by golden fields on both sides. In the distance, gamblers can make out the occasional tree and migrating birds, but little else can be seen. The game is played on a 5-reel, 4-row grid with 50 fixed paylines. There is only one special feature: free spins with sticky Wilds that are added after every free spin. So if you fancy a safari trip that has the chance of paying you instead of the other way around, try Pragmatic Play’s release! And if you are a Safari themed slots fan, also worth checking Hot Safari (also by Pragmatic) and BetSoft Safari Sam. If you fancy classic Fruit machines, Safari Madness might be the one for you. Why to Play Safari King Slot? Pragmatic Play consistently puts out good visuals, and this title is no exception. Each animal symbol has a small animation that plays when it is part of a winning combination. The screen transition into free spins are also amazing. It is not all sunshine and roses, thanks to the presence of playing card icons that ruin immersion. Safari King makes good use of its one bonus. When it lands, it is nearly guaranteed to net you some great pays as a result. As the number of Wilds increases after each free spin, the winning potential climbs to mouth-watering heights. With an RTP of 96.49%, the slot is above the current industry average. There are slots with higher return out there, but 96.49% is more than reasonable. The largest maximum win you can get is worth 1000x your total stake. The one special feature the game offers is good, but it is only one bonus whatever way you look at it. If, like us, you like a bit of variety, you will not find it in this Pragmatic Play release. If the developers added a multiplier Wild on top of everything else, we could die happy. The medium-high volatility may turn off newcomers and casual players. As a result of the variance, hitting the special feature can be incredibly difficult. 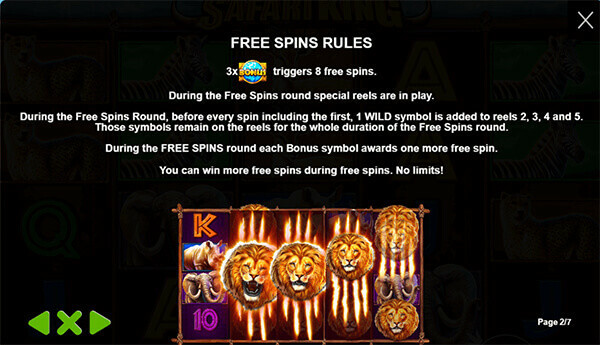 There is only one bonus offered to gamblers in Safari King, and that are the free spins. 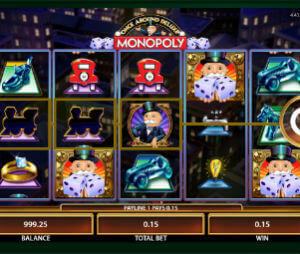 Collect three Scatters on the first, third and fifth reel at the same time to win eight free spins. A different set of reels are used while this bonus is active. Every time another Scatter appears on the playing field, it adds another turn to the counter. Before every spin, including the first, one Wild is added to the second, third, fourth and fifth reel. These Wilds are sticky and remain on the reels until the bonus ends. This slot showed us that less can be more sometimes. Despite having only one special feature, Safari King was very enjoyable, a very rare feat for most developers. While we do wish there was more to do in the game, it does not impact the fun we had playing this recently launched online slot. If the review sounded interesting to you, try the title out. You will not be disappointed.